Pres. 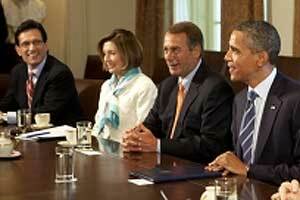 Obama meets with Democrat and Republican Congressional leaders to discuss the debt ceiling on July 10. Both capitalist parties, having given hundreds of billions of dollars to the banks in bailout money, agreed to put the burden of the government's debt on the shoulders of the working class. For weeks, Democrats and Republicans have debated about whether to stab poor and working people in the back or in the chest. With their deal, President Obama and the Democratic Party have agreed with the Republicans that yes, stabbing working people in the chest will do just fine. Now they expect workers to applaud them for having worked together and struck a deal to supposedly avert economic disaster. So try to ignore that piercing pain and suffering over the next months and years—they thank you for your sacrifice. This deal is no “compromise.” It is a bipartisan attack launched by the White House and its allies in Congress on behalf of the banks and corporations against the living standards of workers: $917 billion in spending cuts, with no tax increases on the wealthy. The immediate targets will be education, housing, health care, transportation, environmental protection, and an assortment of social programs and services that are already stretched thin. In November, a bipartisan commission will be tasked with coming up with $1.5 trillion more in “deficit reduction.” While technically this could include tax increases on the rich and closing their tax loopholes, the corporate media is already referring to such tax changes as doubtful. The “deficit reduction” will come in the form of more cuts. And if they can't agree on what to cut, then that too will trigger automatic cuts! Medicare and Social Security will be spared in the short-term, but the last few weeks of ruling-class debate has shown these are hardly “untouchable” programs. The Democrats were willing to put them on the table this time, and with enough pressure from Wall Street, they will do so again. They will be “negotiable” as soon as November. Of course, the whole Social Security system could be put on sound economic footing with a few rudimentary tax measures. Right now, employees pay 4.2 percent of their wages into Social Security. But this is capped at $106,800 in wages, so someone who makes $10 million contributes the same amount as someone who makes $106,800. Workers pay 4.2 percent, whereas such millionaires do not even pay 1 percent. A reasonable first step would be to remove that cap, but neither the Democrats nor the Republicans would dare suggest it. But hold on. Cutting $350 billion over 10 years from the Department of Defense would only be a 5 percent cut. The Defense department budget is nearly four times the size of the Health, Education and Housing budgets combined. Unlike Defense, such departments will be devastated. The possible defense spending cut would have no impact on the endless wars and criminal occupations, which have cost so much in financial terms and human lives. In fact, the bill speaks not of cutting “defense spending” but “security spending,” which includes the Department of Veterans Affairs. Instead of scaling back the forces of war, repression and domestic surveillance, these “security” cuts may easily be aimed at veterans' health care and retirement benefits. Both Republicans and Democrats have falsely claimed that they have an electoral mandate to cut public spending. They have used all of their collective political will to make this cutback program a reality. In fact, if this were a real democracy, the government would have gone after the Wall Street thieves and parasites who everyone knows plunged the country into crisis. Instead, they were bailed out to the tune of several trillion dollars. The public has time and again identified jobs as the most pressing economic problem. If this were a real democracy, the government would use society's vast wealth to respond to the people's most pressing needs. But for the capitalist parties, it is no “emergency” or “catastrophe” that there are 44 million people below the poverty line (and that is with a ridiculously underestimated poverty level of $22,350 for a family of four). Based on demographic changes, the country's elderly population is set to become disproportionately larger than it is today. At the same time, pensions have been systematically eliminated, and 401k plans have taken monumental losses. Social Security—referred to as “supplemental income”—is usually not enough to get by on. In a real democracy, the politicians would be discussing how to expand Social Security payments, not cut them. What can working people do? This bipartisan agreement disproves once and for all the notion that the right-wing tide in this country can be reversed, or meaningful reforms won, through electoral politics. Neither the re-election of Obama nor the election of a Democratic Congress will transform a thing. As a first step, community organizations and labor unions should call for 1 million poor and working people to march on Washington. There should be mass marches and sit-ins on Wall Street and in State Capitols across the country. This article was originally published on LiberationNews.org. Join the ANSWER Coalition in the Jobs, Not War contingent of the August 13 Millions March in Harlem demonstration. We are mobilizing in New York City and organizing people to come to the demonstration from Washington, D.C., Baltimore, Philadelphia, New Haven, Boston, and elsewhere. You can download the August 13 Jobs Not War contingent leaflet and distribute it among your friends and co-workers. There are versions in English and English / Spanish that can be downloaded. If you can't come to the demonstration but would like to help subsidize the transportation of other who are traveling to New York City on August 13, you can make a tax deductible donation today. Click here to make a much-needed donation.